The procedure is very simple. Hydrogen peroxide gel is applied to the teeth. 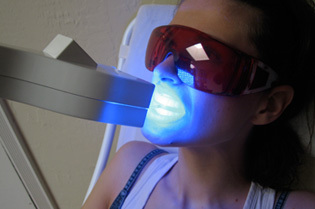 A cold blue light is placed directly in front of the customer’s exposed teeth and run for 15-20 minutes per treatment. You typically perform 1 to 2 treatments on each customer during the same session, and the more treatments you perform the better results you obtain. A cosmetic teeth whitening treatment will NOT make the teeth pearly white. It will make them whiter. How much whiter? It really depends on a multitude of factors, including how stained the teeth were before the whitening, what kind of staining agent caused most of the coloration, how well the person’s enamel reacts to peroxide and the number of treatments performed. It also depends on the kind of gel (carbamide vs. hydrogen peroxide), the concentration of the teeth whitening gel and the kind of application system. Although there are significant differences among the teeth whitening lights available in the market, the most important factor is the gel. Hydrogen peroxide works much better than carbamide peroxide. 16% hydrogen peroxide is the strongest teeth bleaching gel you can use without the use of a gingival barrier. However, this gel is so strong (and therefore gives such good results), that it cannot be used with a mouth tray because it gives too much gum irritation. The only way to use this gel and avoid severe gum irritation is with our system.